Rigid Lights - D-SS Series UNIVERSAL - Dezod Motorsports Inc - Home of the automotive performance enthusiast since 2002. 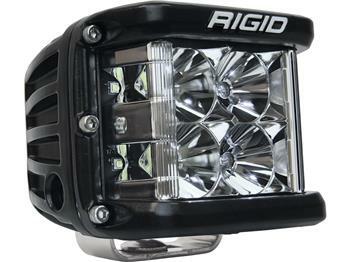 Say Good-Bye to blind corners wit RIGID’s new D-SS, Dually Side Shooter LED pod. Perfect for any application that requires a wide spread beam, including A-Pillars, Fog Lights, and motorcycle applications. The D-SS pod incorporates the same powerful optics and legendary LED technology as RIGID’s popular D-Series lights but with the added benefit of additional LEDs aimed to the side for a much broader beam. The D-SS fixtures boast up to 120-degrees of horizontal lighting coverage when used in pairs or when used in the single light applications.